Mongolia is an incredibly photogenic country with diverse landscape, pristine nature and beautiful nomadic people, whose lifestyle has been little changed since the 13th century Great Mongol Empire. 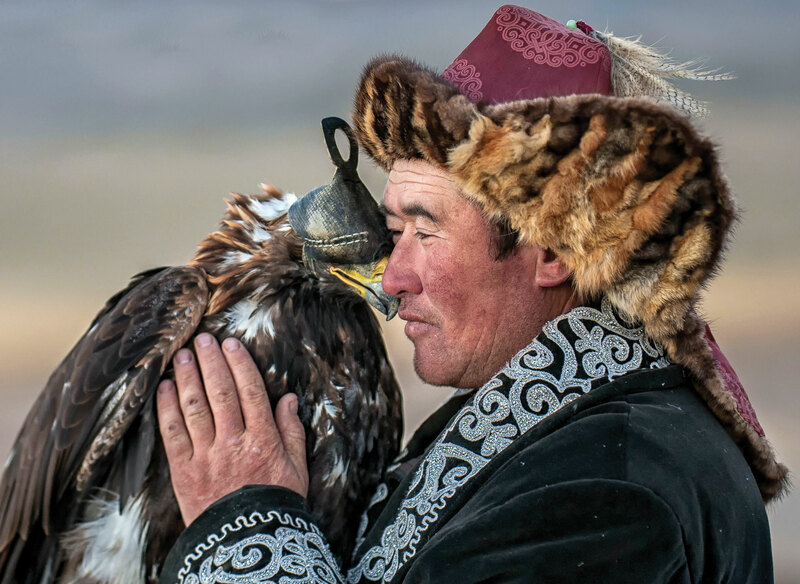 Tested photographers are often mesmerised by the varied natural and cultural wonders that Mongolia has to offer. This photography tour will guide you to through the best of Mongolia’s photography sites, to assist you create a magnificent mosaic of Mongolia. The first leg of the tour will lead you through the highlights of the Central Mongolia including photography visits to the beautiful Khorgo-Terkh national park, ancient capital at Karakorum with the legendary Erdene Zuu Monastery, and the UNESCO world heritage Orkhon River Valley. 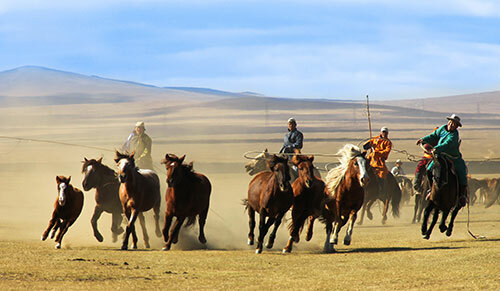 On the second half of the journey, you will explore the climaxes of the mysterious Gobi Desert such as Bayanzag Flaming Cliffs and explore for dinosaur remains, enjoy a sunset camel ride at the Khongor sand dunes and oasis, and hike in the glacial Yoliin Am Gorge with glimpses of rare wildlife, for the best possible photo opportunities. 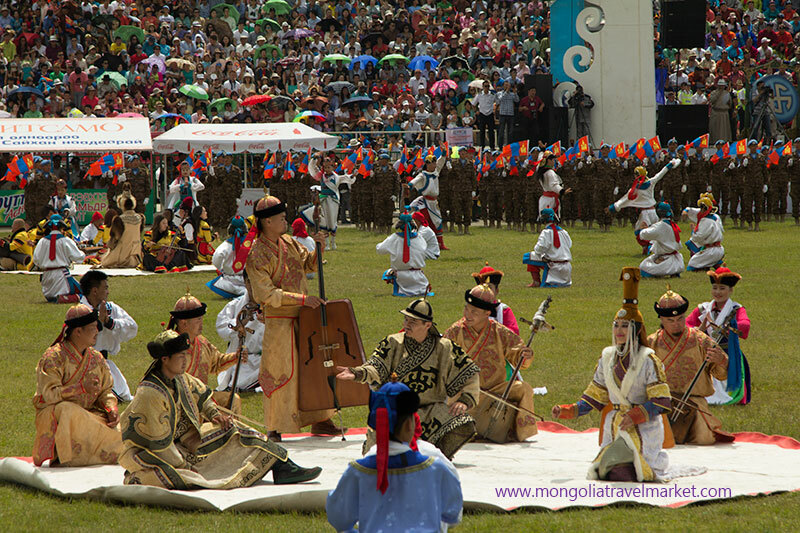 Moreover, a day at a village Naadam Festival will provide you with an intimate experience of rural Naadam featuring The Three Manly Games of the Mongols including the archery, wrestling and horse races as well as traditionally dressed locals and their music and dances. Besides these, you will have the opportunity to meet and photograph real nomads. You might have heard many stories of travellers being dazed by the sincere hospitality of the nomads. However, if you look deeper into their spirit, you will witness how strong, stern nomadic men can be moved to tears by their race horses rushing to a finish line. Their lifestyle, religion and philosophy are shaped by the Mother Nature to a great degree; and nomadic customs, music, literature and costumes have been passed through centuries. 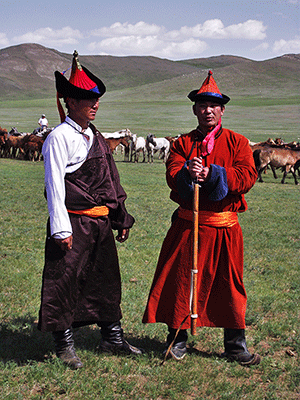 And in this hectic 21st century only Mongolian nomads welcome strangers with unlocked doors. There will be plenty of occasions you will meet real nomadic people and enjoy their heartwarming hospitality during this photography tour. 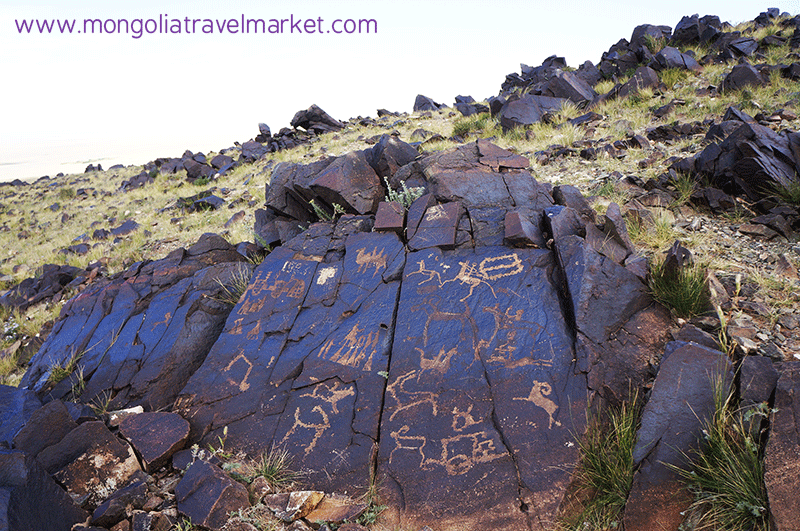 Premium Travel Mongolia photo tour guides are knowledgeable, experienced, and are happy to be the ambassadors of their country. Plus, travelling extensively in remote Mongolia and photographing the wonders doesn’t mean rough travel conditions. We utilize comfortable 4×4 vehicles with AC, clean and comfy Ger camps (en-suite upgrade available) to complete your wonderful Mongolia stay with us. Day 1. Jul 7. Arrival in Ulaanbaatar, Mongolia. Ulaanbaatar photo shooting. Day 2. Jul 8. Ulaanbaatar - Karakorum (evening shoots). 5-6hr drive. Breakfast at the hotel and drive out of the town to Karakorum, the 13th century ancient capital city of Mongolia. Drive across the green steppes of Central Mongolia with stops for lunch and strecthing legs etc. There’s also many photo opportunities along the way. 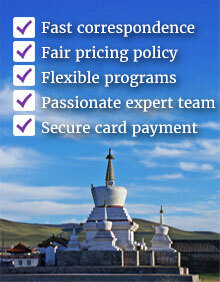 Arrive in Karakorum in late afternoon, visit the Erdene Zuu monastery (architecture & people) and the Karakorum Museum. Check into a Tourist Ger camp and have dinner. In the evening see a traditional folk concert (people). Day 3. Jul 9. 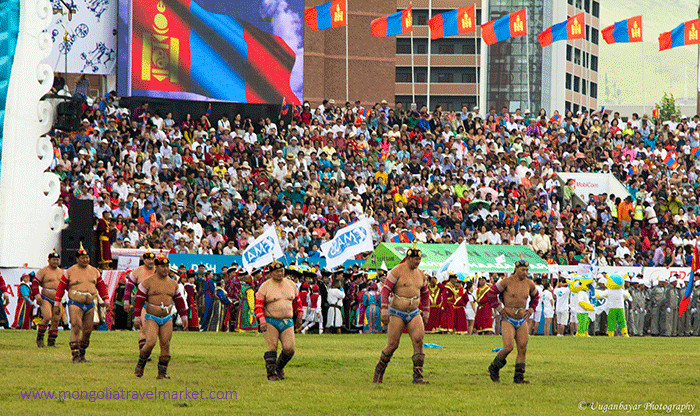 Naadam Festival in Karakorum. A full day at the local Naadam festival with chances to photograph the competitors, Naadam-goers and race horses. Day 4. Jul 10. Karakorum - Khorgo-Terkh National Park (morning & evening). 5-6hr drive. Early rising to enjoy some photo shooting in the Orkhon River Valley. After breakfast we will drive to the north toward the Khorgo-Terkh National Park with a stop at Tsetserleg town to visit the bazaar and photograph people. Arrive in Khorgo-Terkh in the late afternoon, check into Gers and have some rest. Evening photo shooting in the national park with a beautiful lake and an extinct volcano. Day 5. Jul 11. 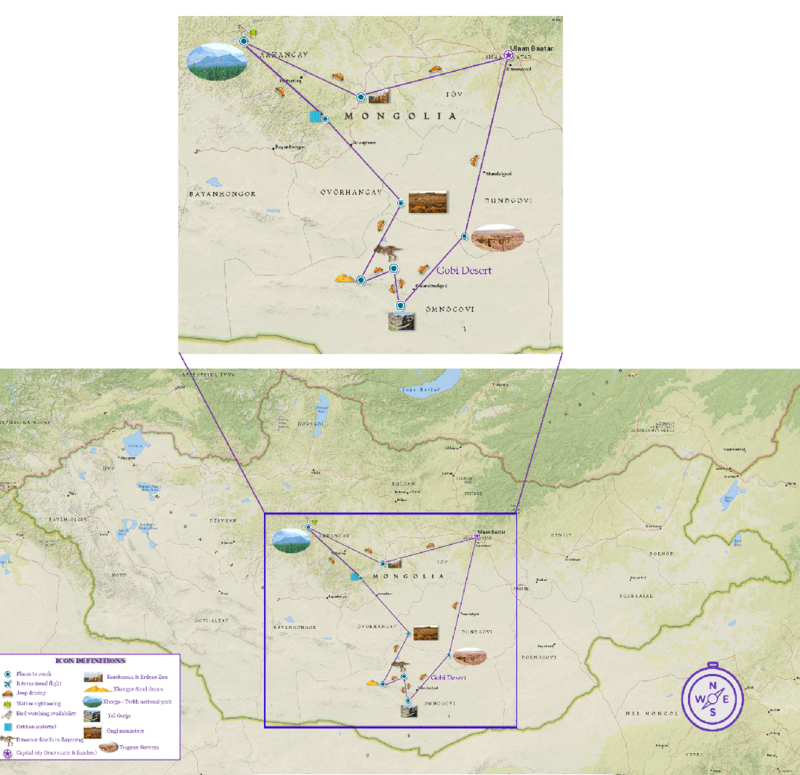 Khorgo-Terkh National Park (morning & evening shoots). Enjoy 2 photo sessions today in the morning and evening. The remainder of the day is for leisure and optional soft adventure activities such as hiking, horse riding and swimming etc. Morning photo shoot in the national park, and drive to the south and reach the Orkhon River Valley today. The Orkhon river valley is a UNESCO world heritage site for being a cradle for several nomadic empires including the Huns and the Mongols. The scenery is simply spectacular with mountains, steppes and rivers. Evenig photo session at the Orkhon Waterfalls. Morning photo shooting. And we head to the Gobi Desert: stop at a nomadic family on the way to see their lifestyle and photograph nomadic women and kids during their daily chores such as dairy making etc. Day 8. Jul 14. Ongi to the Khongor sand dunes 6 hr drive. Morning photo shooting at the Ongi monastery ruins. 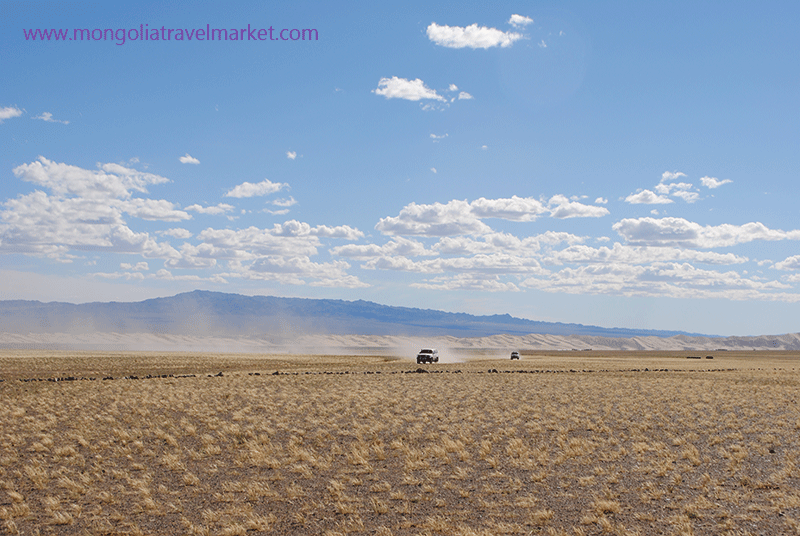 Then after breakfast drive southwards to the Mongolia’s largest and most beautiful sand dunes at Khongor. Arrive in the late afternoon and check into Gers. Rest. Take an evening photo session at the sand dunes. Day 9-10. Jul 15-16. Khongor sand dunes (morning & evening shoots). Morning photo shooting with camel caravan at the sand dunes. Afternoon for leisure. And evening photo shooting. Day 11. Jul 17. 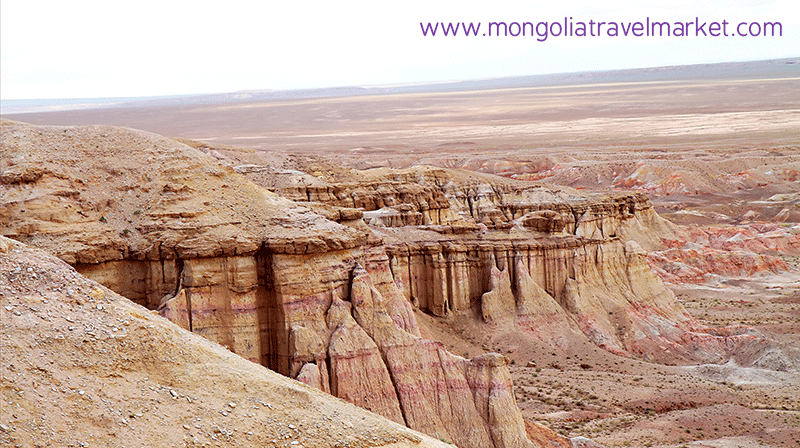 Khongor to Bayanzag Flaming Cliffs (morning & evening shoots). 3-4hr drive. Today we will visit the Bayanzag Flaming Cliffs, where dinosaur eggs were first found by American explorer Roy Chapman Andrews, who also supposedly inspired the fictional character Indiana Jones. Evening photo shooting at the Red Cliffs and the saxaul trees at the sunset. Day 12. Jul 18. Bayanzag Flaming Cliffs, excursion to the Yoliin Am Gorge. (Morning & evening shoots). 3-4hr drive. Morning photo shooting at the Yoliin Am/Mukhar Shivert Glacial Gorge in the Gurvan Saikhan Mountains. In the early afternoon enjoy seeing and photographing a local Naadam Festival. Evening photo shooting at a horse trainer’s. Day 13. Jul 19. Bayanzag to Tsagaan Suvarga cliffs (morning & evening shoots). 4-5hr drive. Morning photo shooting at the Bayanzag Flaming Cliffs. And in the afternon drive to the Tsagaan Suvarga Cliffs in Middle Gobi. 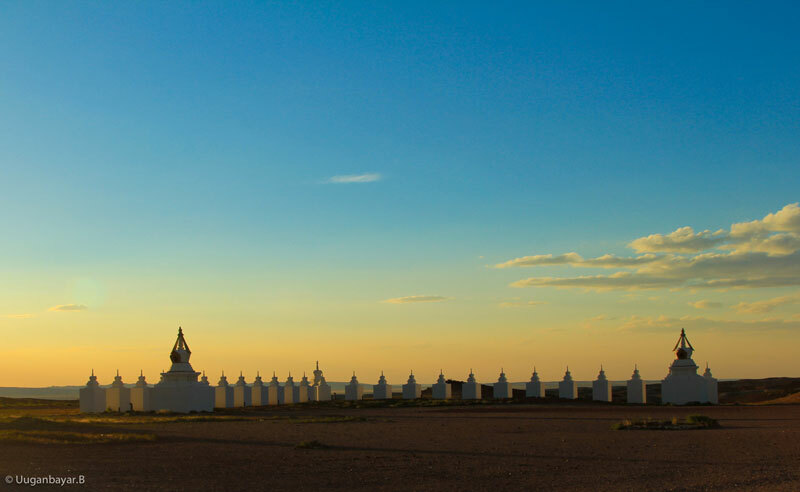 Enjoy evening photo shooting at the White Stupa (Tsagaan Suvarga) Cliffs, which is a unique nature formation in the Gobi Desert. Day 14. Jul 20. Tsagaan Suvarga to Ulaanbaatar (morning shoot). 5-6hr drive. Morning photo session at the Tsagaan Suvarga Cliffs. Then drive to Ulaanbaatar on paved road. Arrive in the early evening and check into Hotel****. Farewell dinner in the evening.